Custom golf umbrellas are a great way to promote your brand at your next corporate event, golf outing, or to give to longtime clients. 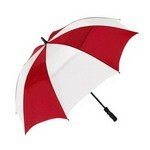 Personalize golf umbrellas with your logo or message. We offer two-tone umbrellas, clear umbrellas, windproof umbrellas, square umbrellas and more, all customized for your company or organization. 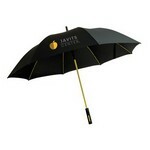 With our personalized golf umbrellas, you'll receive long-term brand exposure and pay very little doing it. 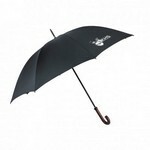 Browse through our selection of custom golf umbrellas below. If you have any questions, please give us a call or start a chat session! The Bogey 60" Vented Umbrella is made from nylon material, has a black rubber spray handle and is vented to resist flipping in heavy winds. The Booster 60″ Golf Umbrella has a steel shaft, double steel ribs, and a straight wooden handle, and a wind proof feature provides extra durability. Our Cyclone Square 62” Golf Umbrella withstands wind up to 60mph and it has a fiberglass shaft and ribs with a rubber pistol grip handle. 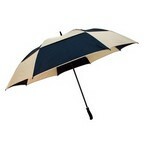 Our Doorman 60" Umbrella is convenient to use as and it has a wood hook handle for a comfortable grip. 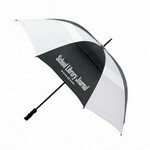 The Legend 64" Golf Umbrella features vented technology for durability in high winds up to 70 mph. The rubberized handle ensures a secure and comfortable grip. The automatic open Mojo 62″ Umbrella is made from durable pongee polyester material and has a color coordinated fiberglass shaft, with rubber handle. The Ultra Force 58″ Golf Umbrella features a fiberglass shaft with a pistol-grip handle, and is vented to withstand wind gusts up to 50mph. The Valet 80" Umbrella offers a vented canopy construction that can withstand strong wind gusts and has a neoprene fluted handle for a comfortable grip. Our Mulligan 64″ Golf Umbrella features a unique shaft with the strength of fiberglass and a wood grain look, along with an hourglass handle.